TechPro Security Products is the premier choice for professionally installing security cameras in a diverse variety of properties. We pride ourselves in finding unique surveillance solutions to meet the needs of our growing list of clients, extending into the thriving marijuana industry. Florida continues to see a growing interest among investors with a desire to open new medical marijuana dispensaries. In fact, Curaleaf, prominent leaders among cannabis clinics around the nation, recently opened the largest medical marijuana dispensary in Tallahassee. All signs continue to point towards medical marijuana gaining more traction in the Sunshine State, too. There is a strong belief that within the next election cycle, a vote to make recreational marijuana legal throughout the state. However, like most states around the nation, there are certain regulatory laws that pertain to any cannabis business operating within the state, especially dispensaries. Installing security cameras is only one small part of the complex laws that Florida dispensary owners must adhere to for legal compliance. Fortunately, progressive professional security camera installation companies like ourselves understand the significance of these laws. We have a full understanding of how to navigate them and deliver video surveillance solutions that not only meet but exceed the requirements asked of marijuana facility operations. Below you can find the highlights involving installing security cameras and video surveillance systems within the official 2018 Florida Statutes involving businesses relating to medical use of marijuana. (III) Recorded images must clearly and accurately display the time and date. (IV) Retain video surveillance recordings for a minimum of 45 days or longer upon the request of a law enforcement agency. As of now, the official statutes for marijuana businesses are not complete, yet. The final legislation is still being written, but one thing remains constantly evident. Security will play a highly prominent role in the finalization of all state compliance regulations for Florida marijuana dispensaries and grow facilities. As evidence, one last section details further instructions for monitoring any cannabis operation at all times to ensure its protection from criminal activity. (6.) Require at least two of its employees, or two employees of a security agency with who it contracts, to be on the premises at all times where cultivation, processing, or storing marijuana occurs. Why TechPro For Installing Security Cameras? TechPro is a leading professional CCTV installation company in Florida that prides itself equally on our customer service as well as a keen attention to detail. We have the industry experience, resources, and qualifications to deliver high-quality video surveillance solutions, especially in settings that present unique challenges. Our team of professional security camera installers utilizes its extensive knowledge of overcoming these challenges to deliver a custom security solution that is as thorough as it is efficient. Furthermore, we also provide alarm systems along with security camera maintenance, repairs, and have the ability to incorporate access control equipment in addition to installing security cameras. By using access control systems, we are able to contain who comes into specific areas while monitoring the people who do enter the area for full accountability. These can be set up entirely different depending on how limiting the security requirements are for certain areas within the property. For instance, all employees with fob keys might be given access to a back storage area, yet only the owner and manager are able to enter into the network room. Of course, each of these factors depends entirely on the needs of your own operation. Installing security cameras with advancements in surveillance technologies and developing setting-specific security environments is our specialty. We also operate within a network of premier security partners to acquire the highest caliber CCTV products at low costs and to achieve more with innovative remote video monitoring solutions. Opening a medical marijuana dispensary in Florida? 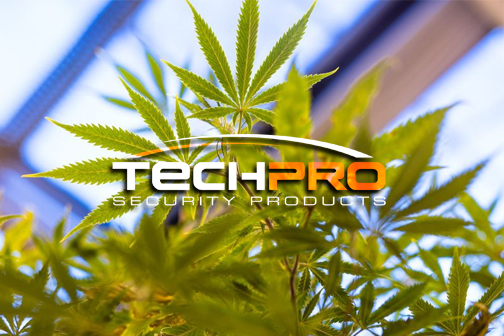 Looking for a company capable of installing security cameras and video surveillance systems that keep your cannabis business fully compliant and secure? Contact TechPro Security Products to receive a free security assessment for your property or book an appointment with us today. You can also call us at 561-922-8416 to speak with a friendly member of our staff in more detail about your requirements.